A small city- like village is located some 70 kilometers away from Irkutsk, surrounded by woods and foggy mountain peaks. This area of land, full of mismatched houses, takes up about 5 kilometers along the shore. Mainly because of the larch trees growing here, the village is called Listvennichnoe, but the locals call it Listvyanka. It is practically impossible to miss it or confuse it with anything else. Listvyanka is the final destination of the shortest federal highway in Russia – the Baikal highway. The old gravel road was asphalted in a record time in the 1960’s, when the Soviet government was getting ready for American President Eisenhower’s arrival. In the end the meeting did not take place, but the new road transformed an old village into a tourist Mecca of the Baikal area. The great geographical location had also made an impact – Listvyanka is situated right next to Irkutsk. Besides this, you can get to Angara’s riverhead in only an hour – and this river is the only one that flows from the Baikal. Regular ship navigation attracts even more tourists who are willing to go to completely different parts of the Baikal area. Both during the winter and summer many scientists and academics come to Listvyanka from a whole variety of countries to explore the legendary lake. However despite all the positive aspects of this little secluded spot in Siberia many travel guides write that you should start your trip in Listvennichnoe “only if you don’t have a choice – that is if you don’t have the chance to travel on the Circum-Baikal railway”. This is not true. Yes, without doubt the best views on the lake open up when you look out of a window of a Circum-Baikal express train or from the Olkhon Island… but Listvyanka is a place where you can at the same time admire the Baikal, dive into its history and try some lake fish. The first written information about Listvyanka can be found in traveller’s notes from the second half of the eighteenth century. These places were hard to get to, so only Cossacks and fugitive exiles were not afraid to explore. In the beginning of the nineteenth century the most important business in Listvyanka was the shipbuilding industry. The icebreaker ships Baikal and Angara, which were built in England, were assembled there. The village prospered very quickly, and soon Listvyanka, through which the commerce passage between Russia and the East lay, came into its golden period. This is how the village transformed into a Baikal pier and at the same time became an important administrative area in the Russian empire. Listvyanka’s guests must pay a visit to the architectural and ethnographic Taltsy complex, which can be found around the 47th kilometer of the Baikal highway. Since 1980 Taltsy was included in the list of 5 largest museums in Russia under open sky – here you can get an eyeful of different historical monuments, architecture and ethnography of the 17- 20th centuries. Market clatter can be heard all around Listvyanka. This is because the grandmas behind their wooden counters are telling you to try “the best fish ever”. There is a new era in Listvyanka – the era of commerce and lease. The locals make up recipes to cook omul, whitefish, herring and Baikal oil fish. All the locals here know how to attract a hungry tourist who had heard so many stories about the incredible taste of Tsar’s fish. You can learn about the deepest lake in the world in the Baikal museum, which is situated right in Listvyanka. This is the lake museum in Russia that was created with the help of the Limnologichesky Institute. 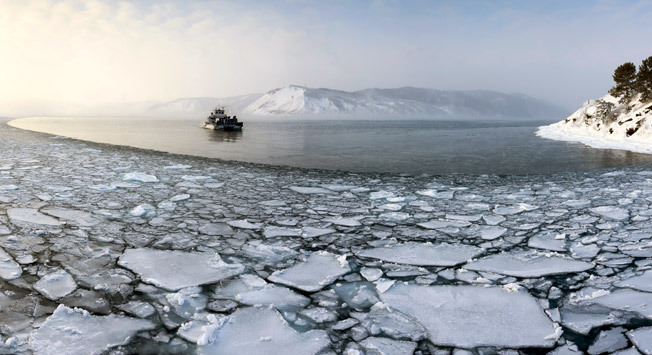 It was founded in 1993 to analyze and keep records about the Baikal. Tour guides can tell travellers how the lake was formed, why it is unique and who lives in its water. In this museum you also have the chance to look at fish and seals in the aquarium, look at protozoa through a microscope and to virtually go 1000 meters beneath the Baikal waters. Listvyanka can make completely different impressions on people. Local souvenir shops, small cafes, which can transform into interactive stores, summerhouses on the shore: here you don’t feel forgotten, unlike in any other small village. During the summer many people here take up “daily diving”, as for the winter, there is a ski–center here – Eastland, where you can ski, snowboard, or just take a ride in a tube. In Eastland there are four slopes of different complexity, the average length is 1.200 meters. In this center you can also go to a Russian sauna (a banya), eat some blini (pancakes), and admire the Baikal from a sky deck. When the Baikal is covered in thick ice, locals organize rides on dogsleds and in sleighs. In February they organize ice sculpture contests and other amusements that have to do with ice. Here they really do know how to greet guests, what to show them, which legends to tell them and what to offer them to eat. You can have a great supper in the Proshliy vek café, or in the restaurant/ barbeque bar of the Mayak hotel. Most of the time tourists buy food at local markets and then get settled on the lakeside in garden-houses or right on the rocks. The Shaman rock — a reserved cliff right next to the Baikal Lake, near the riverhead of Angara. It’s a natural landmark of the Pribaikalskiy National Park; habitants of the Angara River for centuries have believed that this cliff has unusual powers. Cherskiy peak — a mountain peak 700 meters high, there is a scenic viewpoint right next to it. If the weather is fine then you can see Listvyanka from there and the vastness of the Baikal Lake. You can reach the top of the peak either by foot or using a cable lift. Nerpinary – here you can see a show of trained seals. They sing, dance, play with a ball, count and even draw. Seals from the Baikal are very loveable and funny creatures. The cut version of the text is being published. The original version in the Russian language can be found here.